I like small appliances and gadgets. I depend on them now that I’m a food allergy mom and cook dinner every single day. If there’s an appliance or gizmo that will make cooking easier, well by golly, I want it! Here is a list of my favorite small appliances, gadgets and doo dads that make my life a little easier. Bread Machine: I use this a few times a month. I make my own pizza dough. My machine has a dough setting. The recipe I use isn’t even for the bread machine, but I tried it and it works. I don’t want to make bread if I can’t figure out how to do it with my bread machine. I’m not lazy… I have too many other things to do! I also make a super easy and yummy homemade bread. I choose the “rapid white” button and we have homemade bread in less than an hour. 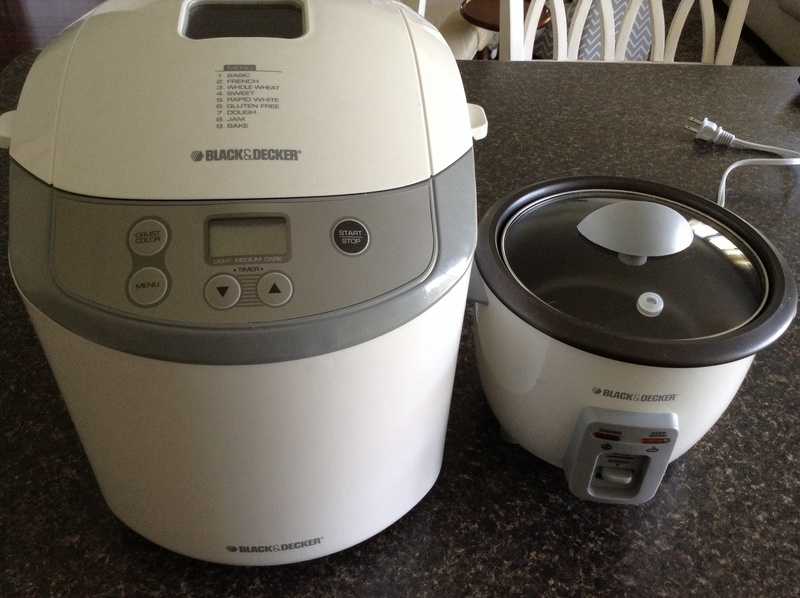 Rice Cooker: I LOVE my rice cooker. I mean, I can’t live without it. Okay, *maybe* I’m exaggerating, but the point is, I DON’T want to live without it. When my old rice cooker broke, we immediately replaced it. I usually make rice at least once a week. This is a must have in my kitchen. Enough said. Slow Cookers: I have a 12 year old Crockpot that I received as a bridal shower gift. I use it several times a month. I have a smaller one, too. I love having two different sizes. I want a third one, but I haven’t found one on clearance yet. You can never have too many slow cookers, right? Wok: We love stir fry! We have a big, ole wok and enjoy using it. I’ve also found it’s great for holding a ton of spaghetti sauce. Like several jars of sauce plus meat. Pizza Pans: Oh, cheesy and gooey pizza…I mourned you. Especially you, “Pizza, pizza!” We had to break up, you see. It’s not me…it’s you. I’ve moved on to homemade dairy free pizzas and I think I found the key- a pizza pan with holes! I bought two inexpensive pizza pans from Hy-Vee. The last pizza crust I made tasted just like the pizzas we used to buy. It is nonstick so I didn’t have to fight the pizza with the spatula to get it off of the foil. Win! Also, there was something about the pizza being round instead of the rectangular shaped ones I was making… It made me feel happy. It’s the little things, ya know? Grill Basket: I love summer because the Huzz grills a lot. And I love handing him the protein to grill and a grill basket full of fresh veggies! I season the veggies with olive oil, salt & pepper. That’s it. Easy and fresh is the best! Microwave Popcorn Popper: We use this to make popcorn. Just last week, SG was watching yet another movie on NetFlix. I decided she should have some popcorn. I whipped together a homemade, freshly popped batch of “Dragon’s Breath” popcorn. A few years ago, I had no clue how to do this. Food allergies have made us better eaters, that’s for sure! Keurig: Okay, this is my list so I have to include it. I wake up and go straight to the Keurig. Even the short wait for the Keurig to heat up seems like it takes too long some mornings. Little Mama (that’s me!) needs and loves her coffee with Silk french vanilla soy creamer. Gotta have it. No coffee, no talkie! What are some of the items you depend on in your kitchen? My fabulous bread maker & rice cooker! 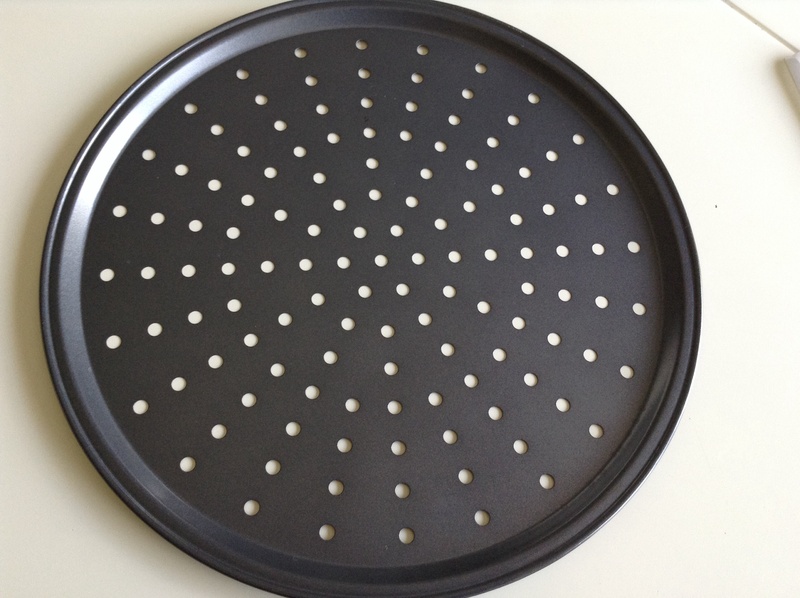 My handy dandy cheap pizza pan that has rocked our pizza world!